I cannot choose a favourite among the saints. They come to me in my hour of need bringing their vast array of gifts as our Lord commands, and by their lives, teachings, and prayers, they each bring me great encouragement and inspiration that cannot be duplicated by another. I have come to see the saints as great friends and mentors in the spiritual life, and my “elder” brothers and sisters in Christ. Yet there is one saint who had entered, unsolicited, into my affections like a little child who has crept up onto my knees to be embraced without my beckoning. She is the “Little Flower” who won my heart by showing me how to be audacious with God. Here was a girl, who, for all her faults, weaknesses and irritating foibles, never doubted for a moment that she was greatly loved. I have always doubted my loveableness because I thought that depended on me. Thérèse had an unwavering trust because she knew that God would always find her loveable because God IS LOVE, and she just needed to lap up the love of her doting Father and Beloved Spouse Jesus Christ. 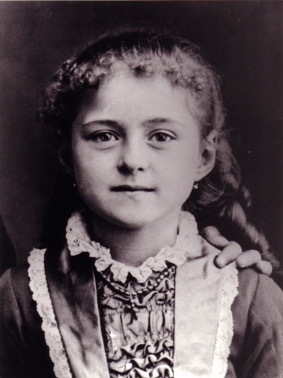 Yet, for all her child-likeness, there is nothing insipid, presumptuous, or mediocre about Thérèse’s love for Jesus. There is the heart of a lioness in this little lamb. And it was her irresistible blend of uncompromising zeal for souls and humble acceptance of her total dependence on God that won my heart. Her “Little Way” is based entirely on the gospels, and as such, I am convinced that her vocation has been to merely articulate what every Christian disciple must and will discover for themselves. Her way is “little” in the same way that Christ says his yoke is easy and his burden light (Mt 11:30). Only those who surrender themselves wholly into God’s hands will understand. Happy feast day, my beloved sister and friend in heaven!